Kelly is a wife, mother, and pursuer of Jesus who lives in NC, where she has lived most of her life. When she's not working on a styling project, she loves to spend time with her family and friends, go for a run, read a good novel, and drink a big ol' cup of coffee. Her home is her haven and loves to spend a Friday night with her husband, watching a movie and eating a big bowl of Ben and Jerry's, The Tonight Dough. Kelly graduated from NC State with a History degree and immediately after graduating, taught high school Civics and Economics for the next few years. Also after graduation, she married her college sweetheart, and three years later, they had their first child. The weekend their daughter turned one, they packed up all of their belongings and moved overseas to Central Asia for missions. At the end of that year living overseas, Kelly got pregnant with their son, and they moved back to NC where they settled and made Greensboro their home. A couple of years after the birth of their son, Kelly got pregnant with their third child- a little girl who made a crazy and quick appearance into the world. She now spends her time taking care of her babies and splashing colors on a canvas. 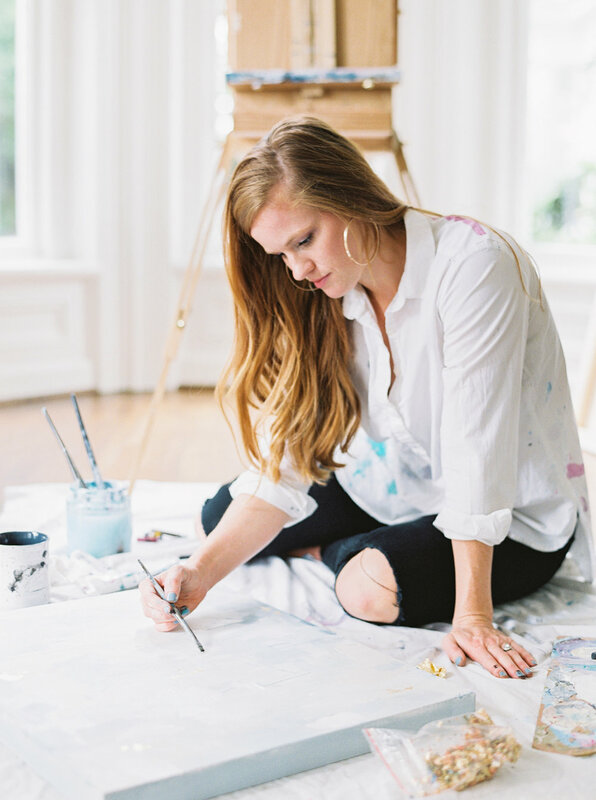 Follow along here to watch her create!